Last week Google announced that the +1 button now enables you to share content with your connections on Google+. This is the natural progression for the +1 button, which hit the scene before Google+ (the platform) did. Similar to the Like button for Facebook, it makes sense that the content you +1 can get pushed back Google+ for your connections to view, visit, share, etc. You can view a screenshot below of this in action. When you choose to share content via the +1 button, you’ll notice that an image thumbnail sometimes shows up, along with a title and description. Google announced that they are giving site owners more control by letting them customize these elements, including the title, description, and image used for the thumbnail. This can definitely help publishers achieve “maximum sharability”. By adding some additional markup to your webpages, you can tailor the elements that show up when visitors share your content via the +1 button. I’ll cover those elements and how to add the markup below. I quickly mentioned this above, and wanted to explain what this means. I’m a firm believer that the image, title, and description can have a big impact on how your content gets shared, re-shared, +1’d, liked, etc. The reason is simple. Most people have hundreds of friends across various social networks (and some people have thousands of connections). The right “creative” can help your content stand out as your connections are scanning their circles in Google+. If you can catch their attention, you have a greater chance of having those people visit your content, +1 your update, and then share your post or update with their own connections. This can lead to a spike in traffic and exposure, which are both good for your business, blog, company, and digital efforts. 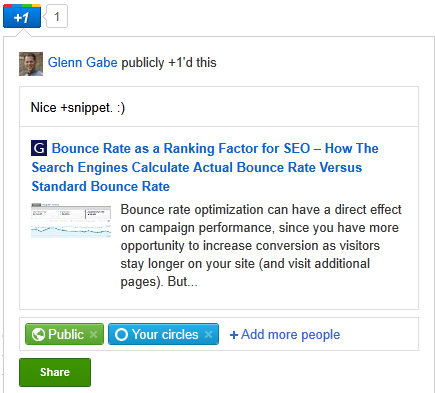 Let’s take a look at how you can customize the snippet shared on Google+ when visitors click the +1 button. In a previous post, I explained how you could customize your +1 button code to unlock exclusive content. You can check my post out in greater detail to learn more about adding the button to your site, editing the code, etc. For this post, I’m going to focus on how to add markup to your html content in order to tell Google which elements should be used for the thumbnail image, title, and description when shared. You can accomplish this by adding schema.org attributes to your content, which will tell Google which elements to use. In order to do this, you’ll need to use the Article item type when adding the code. In addition, you will need add an element and attribute to your opening body tag in your document, which is the itemscope element and itemtype attribute. See below. The “name” attribute will provide the title you want to use when visitors share your content, and the “description” and “image” attributes are self-explanatory. The great part about adding this markup is that you choose which elements to use for the image, title, and description versus leaving Google in charge of doing so. For example, if you have a killer visual that you want to make sure is used, or if you want to include a great title that’s not the title tag of the page, then you should use this markup to make sure your suggestions are used. Remember “maximum sharability” that I mentioned earlier? Controlling these elements can help. Note, if you want to understand the order of precedence that Google will employ when choosing the elements for the snippet, check out the help page about the +snippet attributes. You’ll see that Google recommends using the schema.org attributes over other methods. Let’s walk through a quick example. I’ve added the necessary markup to this blog post in order to show you how it works. You can walk through the following steps to add the markup to your own webpage. Next, let’s use the title tag as the title of the snippet. To do this, you need to add the itemprop=”name” attribute to the title tag. Last, let’s choose the image thumbnail that gets displayed by default. Find the image that you want to use and add the itemprop =”image” attribute to the img tag. Note, you can use any image that’s on the page in question. That’s it! You have successfully added the necessary markup for controlling the +snippet. If you want, you can test it out this page now by clicking the +1 button above. You should see the elements that I chose for the +snippet when you share this on Google+. Google provides a way to test the markup on your webpages to see if your code is set up properly. It’s called the rich snippets testing tool and you can use it to test your +snippet. Simply visit the tool and then add the URL to the form. Click “Preview” and you should see the structured data that Google extracted from your webpage. You should see each attribute listed, along with the elements you chose to use in the +snippet. Google+ is growing rapidly, and members will be sharing more and more information there. As I covered in this post, Google is now enabling webmasters to control the snippet that gets shared, which can definitely help with exposure, +1’s, shares, etc. Using some basic markup, you can easily control the elements that gets used for your +snippet. So, in a digital world where you often can’t control how content gets shared, you can have some control here. Therefore, I recommend you add this markup. Again, think about “maximum sharability”. I rarely take the time to post updates on my blog about company news, as I try to keep The Internet Marketing Driver focused on providing helpful digital marketing posts! That said, I’m really excited about some recent G-Squared Interactive news and decided to post an update today. First, in July I wrote a post on Search Engine Journal about Google+ Advertising Opportunities, based on the recent launch of Google’s social platform. 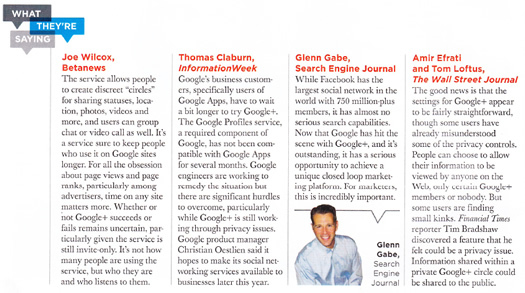 That blog post was quickly noticed by Direct Marketing News, and a quote from my post was featured in the August issue. You can see a screenshot from the magazine below, and you can view the entire article as a PDF. If you end up reading the entire post on Search Engine Journal, you’ll understand the incredible opportunity Google has for connecting Search and Social, which is something that no other company has done in the past. Google could potentially add billions of dollars in advertising revenue via Google+, and my post explains some possible ways it can be implemented. You should check it out if you haven’t already. In addition, I have exciting news about some of my analytics-focused blog posts. In June, Google reached out to me regarding my post about using Advanced Segments in Google Analytics to Identify SEO Problems. It ends up Google decided to feature that post in the Google Analytics Help Center! The featured article went live last month. Needless to say, I was thrilled to see Google feature one of my posts. I love writing in-depth tutorials about using Google Analytics to analyze digital marketing campaigns, Search traffic, etc., so I was honored to have Google feature one of those articles. In addition, I found out that several more of my posts will be listed in Google Analytics Help Center in the coming months. I will post updates here on my blog when that happens. I look forward to sharing more exciting news from G-Squared. I have updated this post based on recent changes to Facebook. Due to the introduction of Timeline, the process for removing your mobile contacts has changed. And yes, it’s harder to find now (which isn’t shocking since we’re talking about Facebook. :) Follow the updated instructions below to remove your mobile contacts from Facebook. Last week, yet another Facebook privacy issue hit the scene. Actually, it has been around for a while, but was just brought to everyone’s attention last week. This time users learned that there was a good chance all of their mobile contacts had been synced (and uploaded) to their Facebook accounts, including the phone numbers of those contacts. The sync functionality was opt-out, and not opt-in, which is absolutely ridiculous. It was somewhat disturbing to see all my mobile contacts sitting in Facebook, including all of their phone numbers. Again, that functionality has been live for some time now (years), but was somewhat hidden in the interface. That caused many people, including myself, to not realize what was going on. Wait, But I’m Not Friends With Them on Facebook! I started noticing certain issues before the news was released by major blogs and publications. The reason is simple. Facebook started showing profile information in my right sidebar of people I wasn’t friends with on Facebook, but did know via business (people that were in my mobile contacts). It struck me as really odd… For example, how did Facebook know I was connected with them at all?? That’s either a pretty darn robust algorithm, or they have additional information. Well, Facebook did have additional information, which was a list of my mobile contacts that had been synced with my Facebook account! Although this was disturbing, it unfortunately wasn’t shocking given Facebook’s history with privacy issues. After the issue was uncovered and friends started telling friends that they should remove their mobile contacts from Facebook, reality hit. Nobody knew how to do it. This was brilliant for Facebook, which would love to keep your contacts in their system. Think about it, Facebook now had access to the contact information of millions of people, some of which weren’t on Facebook. They could also use that information to help members grow their following and connections on the massive social network, which could end up impacting advertising revenue. 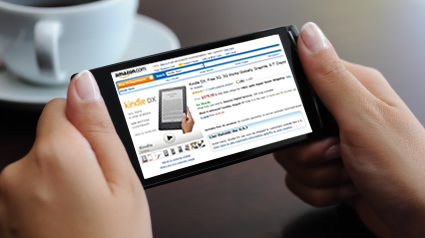 Think about it… there would be more inventory and opportunities to display advertising. Some instructions popped up across the web, but most referenced how iPhone owners could turn off syncing via their Facebook mobile app. There simply weren’t great instructions for Android owners. Some instructions I read simply said, “turn off sync in your mobile app”. The problem was that the Facebook Android app doesn’t have a sync option. Given what I do for a living, I had several people ping me for accurate instructions, since they were still seeing their mobile contacts on Facebook (with phone numbers). That’s after going through the removal process that Facebook provided on the site. Again, to be fair, Facebook did state that you should turn off “sync” before clicking the remove button on its site. The problem was that many people didn’t know how to turn off sync. The confusion I’ve seen and heard with Android owners is why I wrote this post. My hope is that you can follow the steps below and feel confident that your mobile contacts will stay on your mobile phone, and not find their way to Facebook (where they can be used a number of ways by the social network). Without further ado, here are the steps you can take to remove your mobile contacts and phone numbers. 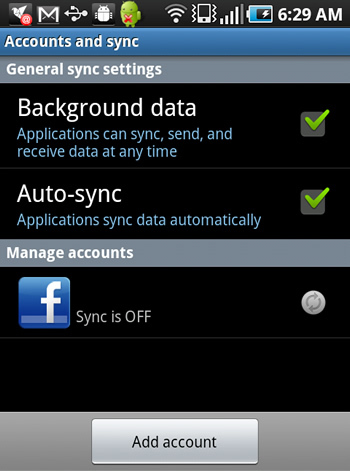 Facebook states you need to turn off syncing on your mobile phone before using the page on its site to remove your contacts. But where is the “sync” option on your Android phone? Good question and I finally found the option after digging around. The option is not in your Facebook mobile app, which would be the logical place… Instead, it’s in your Android settings, under Accounts and Sync. But it gets more complicated than that. 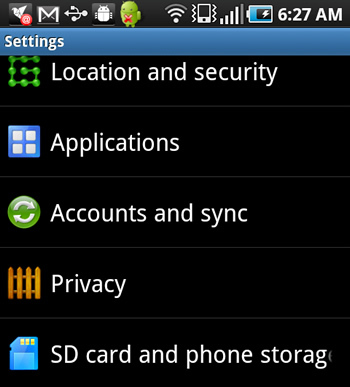 When I went into these settings, I saw several accounts that were syncing, but not Facebook. That’s strange and could be the issue that others were running into when trying to remove their mobile contacts. 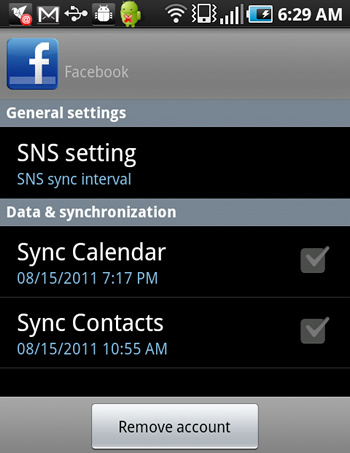 I ended up adding my Facebook account in “Accounts and Sync”, and then making sure that sync was off. Then I went and removed my mobile contacts from Facebook. This worked for me. If Facebook is listed, tap the icon to bring up its settings. Make sure “Sync Contacts” is turned off. You can also turn off “Sync Calendar” as well. If Facebook is not listed, then click “Add Account” to add it to the list. Then make sure that “Sync Contacts” is turned off. You should now be set from a mobile phone standpoint. Log into Facebook, click the “Friend Requests” icon at the top of the screen, then “Find Friends”. Then click “Manage Imported Contacts” in the upper right-hand corner. Your contacts will be displayed (including both Facebook friends and mobile contacts that were uploaded). You might see all of their phone numbers at this point. Don’t worry, we’re about to remove your imported contacts. Now you should see a mention about removing your imported contacts. Click the link, which will take you to a page with the option to remove your mobile contacts. Go through the process of removing your contacts by clicking the “Remove” button. Once you click the button, Facebook will tell you that your contacts are in the process of being removed, and that it can take a while. This is normal. You should receive a message from Facebook that your mobile contacts have been removed. That said, you should check your contacts again to make sure those contacts have been removed. Note, you will still see your Facebook friends listed, including their phone numbers. You cannot control what they are sharing, so don’t automatically think the process didn’t work. If you don’t want your mobile phone number to show up, then you should remove it from your profile (by clicking the “Home” link in the upper right-hand corner of the screen, then clicking the “Account Settings” link, and then clicking the “Mobile” link in the left side options). You will be able to remove your mobile number at this point. Congratulations, you have successfully removed your mobile contacts from Facebook! If you followed this tutorial, then you have a good chance at keeping your mobile contacts safe from Facebook (including their phone numbers). Unfortunately, there are stories every day about privacy issues with social networks, so it’s important you keep up to date on the changes. This specific issue has been around for a long time, but finally was revealed. I don’t know about you, but I think we are quickly heading to a time when the idea of “social networking privacy” is a misnomer. Until then, hang on as tight as you can to your information, your contacts, etc. If you don’t, then there are a thousand ways it can be used by various businesses. Some for good reasons, and others for bad reasons. Let’s try and minimize the bad. As smartphone sales boom, and mobile traffic is on the increase, I’m finding many marketers are unclear about mobile visitor performance. I say this because whenever mobile comes up during conversations, I ask how well that traffic is converting, and I typically hear crickets (unfortunately). On a similar note, there are some marketers that are making decisions about creating mobile apps, mobile websites, transforming content, etc. without analyzing their mobile traffic. They hear that Android phones, iPhones, and iPads are selling like crazy, so their knee-jerk reaction is to make serious changes to their websites. That’s dangerous, since they are basing changes on opinion and not data. And if you’ve read previous posts of mine, you know I’m a firm believer in basing changes on hard data. It’s one of the reasons that analytics is a core service of mine. So, if you are wondering how your mobile traffic compares to your desktop/laptop traffic, then this post is for you. I’m going to show you a quick and easy way to use the new Google Analytics to understand top-level mobile performance. Note, you’ll probably want to dig much deeper than what I’m going to show you, but this process will give you real data about mobile performance. I want you to be comfortable the next time your CMO brings up mobile traffic at your weekly meeting. As everyone else in the room is nervously quiet, you can be the one that starts presenting real numbers, based on Google Analytics reporting. Let’s dig in. In order to make smart and informed decisions about mobile strategy, you need to at least have a basic understanding of how your current mobile traffic is performing. In addition, it’s a wise move to have data points handy when asked how your current site handles mobile visitors. For example, if your CEO or CMO suddenly want to know the percentage of revenue or conversion coming from mobile visitors. As explained earlier, instead of awkward silence, you can be the one speaking up and giving hard numbers. Using the methods listed below, you can fire up Google Analytics, access just a handful of reports, and view performance data for mobile visitors. In addition, you can view mobile performance by operating system (iPhone, Android, iPad, Blackberry, etc. ), since we know that’s the next logical question your CMO will ask. :) Before we hop in, you’ll be happy to know that the latest version of Google Analytics provides mobile reports that contain this information. Using this data, you can quickly understand if mobile visitors are having problems when visiting your site, if they are bouncing, not converting, etc. After you run this top-level reporting, you can choose to dig deeper, identify changes to make, and form a stronger mobile strategy. I’m going to explain two quick methods for accessing mobile reporting in Google Analytics. Both reports are contained in the Mobile reporting tab within the Visitors section of Google Analytics. The first will enable us to see a top-level report for desktop and mobile visitors, while the second report will enable us to view mobile visitors by operating system. 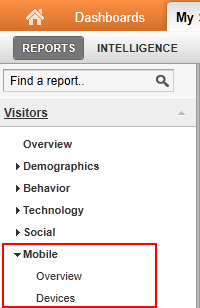 In the new Google Analytics, you can access mobile reporting in the Audience section of the UI. Click Audience, and then Mobile to reveal two reports (Overview and Devices). Note, Google Analytics has updated the interface, and the tab used to be named Visitors. The first report we are going to access is the “Overview” report. This report simply shows mobile visitors versus non-mobile visitors. Although this looks like a simple report, it can show you the overall performance difference between the two segments of traffic (mobile and desktop visitors). Once you access the report, you’ll see two rows of data, one labeled “Yes” for mobile visitors, and the other “No” for non-mobile visitors. View the screenshot below. If you have set up multiple conversion goals, then click the Goal Set tabs. By the way, notice the process you are going through to analyze mobile traffic in Google Analytics is quick and easy, but also very powerful. Many companies I speak with aren’t armed with even the most basic data regarding mobile performance. By quickly going through this process, you will have a top-level view of mobile performance based on data. This will enable you to make informed decisions about how to best move forward with your site content, how to drive conversion via mobile visitors, etc. Basically, you’ll have data backing your case. Let’s say that mobile traffic has a high bounce rate and low conversion (obviously). Your next question might be, “which mobile operating systems perform best or worst on my site?” For example, Android vs. iPhone vs. Blackberry vs. iPad. The good news is that you can quickly see the breakdown via the “Devices” report in the Mobile reporting in Google Analytics. Once you click the “Devices” report, you can dimension the report by mobile operating system by clicking the “Operating System” link (which is located horizontally at the top of the report.) See screenshot below. Once you click the operating system dimension, you will see all of your mobile visits broken down by mobile operating system. Then you can go through the same process we used above to view bounce rate, conversion, revenue, etc. You might find that certain OS’s have more problems than others. For example, maybe iPad traffic has a 92% bounce rate and very low conversion rates, where Android phones have a 42% bounce rate and decent conversion rates. You won’t know until you run the reporting. And again, you will probably want to dig deeper once you get a top-level view by OS. But again, that’s for another post. The next time you’re in a meeting and someone asks how mobile visitors perform on your website, you can now be armed with data. As I’ve mentioned before, don’t base decisions on opinion when you can analyze hard data via Google Analytics reporting. In just minutes, you can gain a top-level view of mobile visitor performance, and then dig deeper to view performance by mobile operating system. Are you ready to analyze your own site now? Don’t hesitate, go and access the reports I just covered in this post. You never know what you’re going to find.